Lexical semantics can be defined as ‘the study of meaning’, therefore semanticists are interested in the lexical meaning of words rather than grammatical meaning. It is not so much a practical topic but one that requires thinking rather than doing and does not really require any experiments. It is about studying language in isolation and not language in use. Some semanticists see native speakers as having semantic competence. Pragmatics– it would be impossible when studying semantics not to come into contact with pragmatics. Some theoretical approaches have got rid of the distinction between semantic and pragmatic competence. However, it is important to make the distinction between a word’s contribution to the meaning of an utterance and the contributions of context (pragmatics). Pragmatic issues have been touched upon in many lexical semantic issues, like polysemy. Morphology– there is a question of whether word class is semantically determined. Psycholinguistics- Most lexical semantic issues can be addressed from a psycholinguistic perspective, and psycholinguistic methods offer evidence concerning how words and meanings are organised in the mind. Language Acquisition– Unlike grammar, vocabulary is acquired throughout life, so some of the issues in lexical acquisition can be addressed from an adult first- or second-language angle. It consists of the ability to judge which strings of words form grammatical sentences. Similarly, semantic competence consists of the ability to determine the meaning of a particular string of words. Since a particular string of words may correspond to more than one syntactic structure, we can take semantic competence to consist of the ability to determine the meaning of a particular syntactic structure. This ability also consists of the ability to determine the relationships between the meanings of distinct syntactic structure. In the last twenty-to-thirty years there have been changes in the traditional ways of studying semantics. Chomskian linguistics and the nativist view sees all Semantic notions as inherent. However, this view was thought of as being unable to address many issues such as metaphor and semantic change, where meanings within linguistics change over time. Semantics also uses our theoretical knowledge of how language works on a broader level to explain and formally note how meaning works. 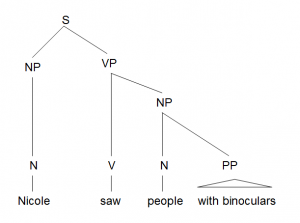 We can present how words are arranged in utterances through drawing syntax trees. 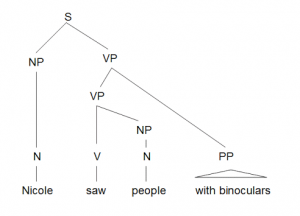 There is a structural difference of the tree when coming to syntax trees that have to do with Semantics, as the senteces used in order to draw the trees are ambiguous. Below there is an example of an ambiguous sentence and two trees showing how meaning affects grammar.